Center Hill Dam is releasing water from the recent rains and to achieve winter pool. Great Falls is pumping water into Center Hill Lake and with the "water in - water out" philosophy, the US Army Corps is running two generators 24-7. So with a two generator release what's an angler to do? Well we went fishing on two generators. All that extra water opens up a lot of options on the river. We hit some back eddy's and side channels in a search for soft water. Big streamers and deep running bait fish patterns are working as long as you can get them down. There are some stripers in the river and the walleye boats are in the dam pool fishing their bait under floats. The dam pool gets a little crowded and the water gets rough with all those waves from the boats running up to the generators and floating back down. There are some fish hitting the top right now too, but we haven't gotten a good eat, although we have had some chances. The high water releases can be dangerous, so stay on your toes if floating the river. The water from the release is clear! The sluice has been turned off and the water temps are falling. Now the water release at the 2 mile point is a cooler 59 degrees. The good news is cool clear water - the bad news, there is a lot of cool clear water. Hang in there though the rains will let up and the lake level will fall, then we can resume our regularly scheduled fishing habits. 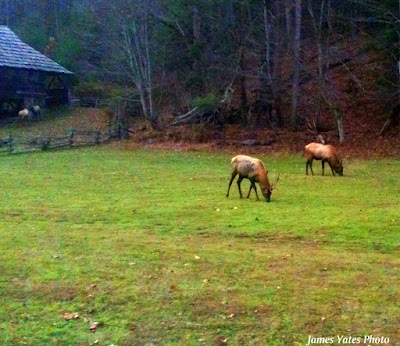 TVA is angler friendly on the Elk on the weekends. They have been running one generator during the week while drawing down Tims Ford Lake and turning off the water on the weekends. The fishing has been favorable with nymphs, soft hackles and with small streamers. The water temps are also favorable at 57 degrees which apparently is making for some happy fish. Even with the water still slightly stained the fish are responding well. The otters have been making their way up and down the river. Sometimes we see them a mile from the dam and at other times they show up at Farris Creek. Overall the Elk seems to be productive for man and creature. The Elk River- The Elk is fishing good in the upper section. Although the water is stained and the bottom is getting the orange coating on the rocks and gravel, the fish seem to be happy. 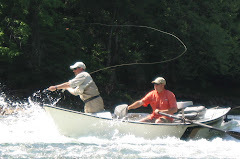 We didn't try swinging a Bust-a-Brown, but I would be someone else's favorite fly rod an angler could get some big numbers before the TVA turns the water loose again in a couple days. The water temperature is running about 57 degrees, according to my thermometer dropped down to 4 feet. Wyatt's birthday present from his bride was a trip to the river and a day of floating the Elk. Wyatt has fished some but not as much as he probably likes. We started at the dam and were into fish within seconds of the fly hitting the water. We started on a double nymph rig with a large nymph on the top and a much smaller Dano-Majic on the bottom. The fish responded to both flies, with the bottom fly seeing about 70% of the action. Wyatt picked up on the casting and mending real quick and then surprised me when he started asking questions about reading the water. He was reading the water and putting casts where the fish were supposed to be, well before lunchtime. Mother Nature came out to show off on this day. We saw the usual heron, otters, ground hog and squirrels. A hawk flew over a recently cut corn field and deer came to gravel bars on two separate occasions to get a drink. The wildlife was out and about as a storm was rolling into the area. We fished until we couldn't see the indicator anymore and then called it a day. The center section of the river was a little slower than I like, the lower section probably would fish better if we would have rolled in before the sun went down. Still it was a good day on the Elk with good water temps and low flow. The generation looks like it will turn on in a day or so and 100 CFS is about as slow as we see on the river at anytime of the year. The grass that plagues the river is getting pushed out so that will free up some additional opportunities to seek out better water while drowning nymphs. Everyone we talked with was having a good day or coming back after recently having a good day. The next few days of heavy rain and storms will probably keep the river quiet,. After the generation ceases again I would expect the action to pick up where it left off. It was a pleasure spending the day with Wyatt watching him get more comfortable casting and mending while reading the water. I am looking forward to the next trip. The Caney Fork River- The Caney has seen some increased generation from the heavy rains of last week and it looks more rain is in the forecast. The temps are running about the same as last week. The big difference is the big sluice is now turned off. The generation is just that, straight generation. After the runoff from the recent rain events is discharged and pushed downstream the water will hopefully clear. This is the time of year we begin turning to streamer action as the fish begin to listen to those internal clocks and seek out protein. Nymphs and small midge patterns will still get their attention and the optimist in me says all will be right on Middle TN's favorite tailwater. The Caney Fork River- The water color on the Caney Fork continues to improve. When the release is stopped the water begins to clear and continues to clear until the next round of generation. The browns, rainbows and brook trout are beginning to take streamers during the release. 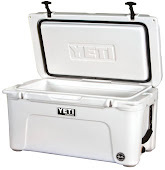 This is good news for anglers who prefer to deliver the groceries. The window of really good streamer fishing is short. Start throwing the big stuff about 30 minutes after the water starts to rise and continue for about an hour after the release is begins to slow. Obviously the times are different for different sections of the river. The sluice water is now releasing at 60 degrees and on sunny days it warms to 62 a couple hours later. After the water levels out nymphs, both big and small, have been working pretty good as well. The Elk River below Tims Ford Dam- Generation has been one of the stories on the Elk. TVA continues to draw down the lake with use of the generator and the water levels are a bit too high, even for the drifter. Although fish are hitting on the bigger release we don't feel it is safe for trips. TVA has been giving us some relief on the weekends. The next couple days of rain will muddy the water on the Elk, but hopefully it will be clearing before the weekend. If TVA can give relief this weekend fish will be caught on the usual patterns and they will still be holding in the usual spots. We are going to have a few open dates over the next few weeks. This time of year means the potential of large fish as they begin to fatten up for Winter. The rainbows are aggressive right now and the browns are trying get back into fighting shape as they come off the spawn. We are going to do the 3/4 day trips, due to shorter daylight. 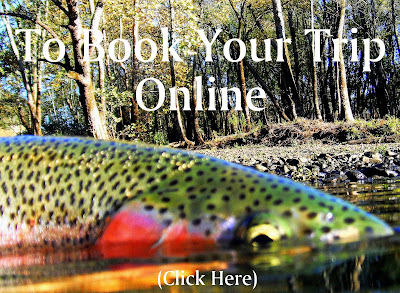 If you are an angler who is looking for a good early Winter trip, now may be the time to give s a call and try for a potential fish of a lifetime. The guys at Calvary Outfitters took a road trip to Ridgecrest North Carolina over the weekend. Most of us left sometime Thursday for a much needed retreat. Ridgecrest provided an excellent atmosphere for the group, some of who came all the way from Dallas Texas. 13 guys, 4 days, all chasing browns, rainbows and brookies. Can You Name This Dam?